Does a title as naturally accessible as the new Daredevil really need a jumping on point in the form of a “point one” issue? Especially when it’s just ten issues into the series and the first six issues have already been conveniently collected in an easy to find hardcover edition? I used to think those kinds of questions were silly and nitpicky. “What do I care? I want more Daredevil!” Having read this issue however, I do find those concerns to be valid. While Daredevil #10.1 was certainly an entertaining read and well worth the price of admission, it also struck me as quite redundant. On the one hand, this isn’t such a bad thing. Lots of people are ever so mildly annoyed with Marvel’s “point one” initiative and many regular Daredevil readers are bound to skip this one. Doing so will not (and should not) negatively affect their ability to get the most out of the upcoming Omega Effect cross-over story. I really shouldn’t be required reading, and it isn’t. Okay, that’s all well for the seasoned fans who don’t really need a jumping on point, but what about new readers who are curious about this series? In all honesty, I think Daredevil #10.1 misses the mark here. While starting out at the point of assuming virtually no previous knowledge of Daredevil (and, to Mark Waid’s credit, it does so rather elegantly), the issue changes speed significantly toward the end by possibly trying to do too much. And I’m not so sure that someone completely new to Daredevil wouldn’t still find themselves struggling to make sense of who all these bads guys in the silly hats are. I think that if Waid had had the lapsed Daredevil reader in mind, rather than the complete novice, this issue wouldn’t have struggled as much as it does. Hampered by the format and by trying to be everything to everybody, this issue is by far the weakest of the new series to date. Mark Waid is, in my mind, a virtuoso when it comes to pacing, plot building and characterization, but all of those skills come across much more clearly in every other issue of Daredevil he’s written. That’s not to say that this is a bad piece of comic book writing (it’s not), but I’d argue that it’s actually a worse jumping on point than, say, Daredevil #9 and #10. What does work well is the technique of delivering the necessary exposition by telling a story within a story. 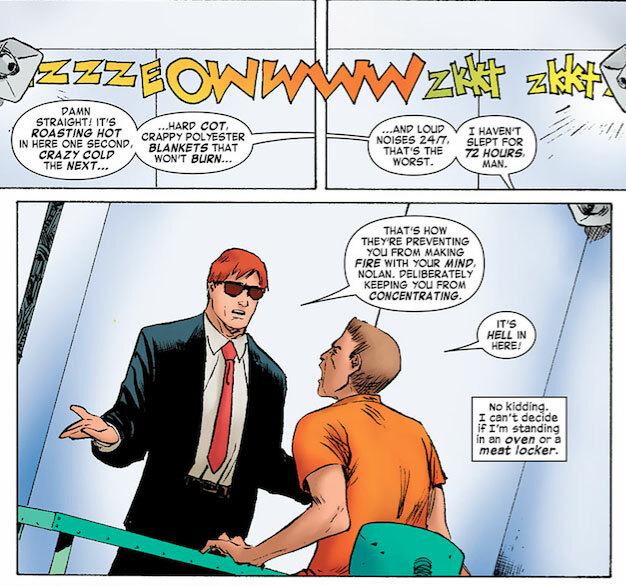 By having Matt go to visit a new client in prison, tied to both of his personae in ways that are revealed throughout the issue, old readers get a new done-in-one story that is still connected to the larger plot, while new readers are served with various clues to who Daredevil is and what he’s capable of. A funny detail is having Matt’s client tell one version of the main story – with plenty of self-aggrandizing embellishments – while the reader is shown the actual events. The final third of the story, where Daredevil gets proactive on his high-powered adversaries is also very amusing and does a good job of advancing the overall Omega Effect plot, even though the reader might be left wondering why Daredevil didn’t do to all of the co-conspirators what he evidently did to one of the factions. Another thing that works against my combined impression of this issue is the art by Khoi Pham. The art really isn’t bad and Pham is particularly skilled at drawing characters in costume. The pages showing Daredevil going up against the Megacrime villains are particularly nice, and Javier Rodríguez’s colors help keep the color palette in the realm of the familiar. However, for the last few months, us Daredevil fans have become used to artwork that’s not just good, but absolutely phenomenal. To me, Khoi Pham just doesn’t reach the same kind of heights here. If you are a Daredevil completist, like me, there’s no reason why you shouldn’t try to get your hands on this issue. You’ll enjoy it. However, if you’re a newish reader looking to jump onboard in time for the Omega Effect cross-over, I would advise you to either get the hardcover collecting Daredevil Vol 3, issues #1-6 (that should give you enough background on how Matt got his hands on the Omega drive), or check to see if your store still has copies of Daredevil #9 and 10. Either of those two options will give you a much better sense of the kind of magic Mark Waid and the rest of the team has been cooking up over the last year. Overall an entertaining issue, but I agree it absolutely falls short of the quality Waid and his teams have brought to the series so far. This whole .1 thing Marvel has been doing is garbage anyway, but as you pointed out, the last 3rd of the book drops you right in the middle of this plot line thats been going for many issues. Any new reader who picks this up is going to be just as lost as they would have been if they’d just picked up any other issue. At was definitely solid but nothing groundbreaking. Are you planning on covering Daredevil’s involvement in Marvel’s current epic, out of character, cash grab, gimmick AvX? I’m not reading/buying it, but some friends who are and I were discussing it last week and this week, and if I’m understanding the setup correctly, then I’m just rolling my eyes at DD’s involvement. When I reached the last pages of this issue, I found it striking how quickly I turned against the entire Omega Effect story. Matt as a character on the run from evil organizations, I was behind. But, once it’s revealed that (a) Matt can use this information for good relatively easily, (b) Matt has used this information for good, and (c) Matt already handed the information over to persons like Reed Richards, then I have no idea where the tension is. Am I to believe that Reed Richards didn’t just copy all the information from his own device? That Matt thinks that not taking down HYDRA, AIM, etc. as soon as possible is a good decision? That Matt thinks this device wouldn’t be safer in the hands of the Fantastic Four or the Avengers or SHIELD? It may all be revealed that this is a complicated plot concocted by all these parties in conjunction to truly nail Lucia von Bardas or whomever — and I hope so! — but a good story shouldn’t simply end in an explanation as to why the hero wasn’t actually acting like an idiot. If I had just jumped on to Daredevil with this issue, It’s doubtful I would have picked up the next. As a side note, this marks the first time that I have seen SHIELD mentioned as an active organization since Secret Invasion. I wasn’t aware Captain America recreated it.